My Life in Bluffton Indiana: This is my first Blog post! Today I had continuing ed. I'm a REALTOR. Every two years REALTORS have to take 16 hours of continuing education before being able to renew our Real Estate licenses. Brokers renew their licenses in the odd years, and Agents renew their's in the even years. I have a Broker's license so this is my year. 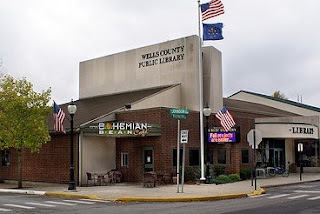 This year's classes were held at the Bluffton Wells County Public Library. What a great facility we have in our library (I'll save more info about the Library for another post). There were about 40 real estate professionals in attendance. I was fortunate that I only needed four additional hours to complete the 16 hour requirement. I attended yesterday from 8 a.m. until 10 a.m. and then again today for the same hours. Yesterday's class was on Indiana License Law - very boring. Today's topic was Social Media.....so here I am! Socializing through media. The instructor was Allie Hostetter from IAR (Indiana Association of REALTORS). She is young and very tech savvy. I don't know how many of the participants in the class will do anything with the things she talked about. She talked about Facebook, Twitter, LinkedIn, and other things, I have a Facebook page for myself and a business page for our real estate firm Facebook/McBride & Associates Real Estate. Allie also talked about blogging. I thought it sounded like fun and one thing that I could have in addition to our Facebook page. So, here I am. From time to time I will come here and talk about the things that are going on in my life and our community. So, please stop by and visit me!